A man in uniform and a bride in a beautiful gown always makes a striking couple. But Kacie's gown had an element of regal-ness that was extra special. The sparkly yolk was just stunning. 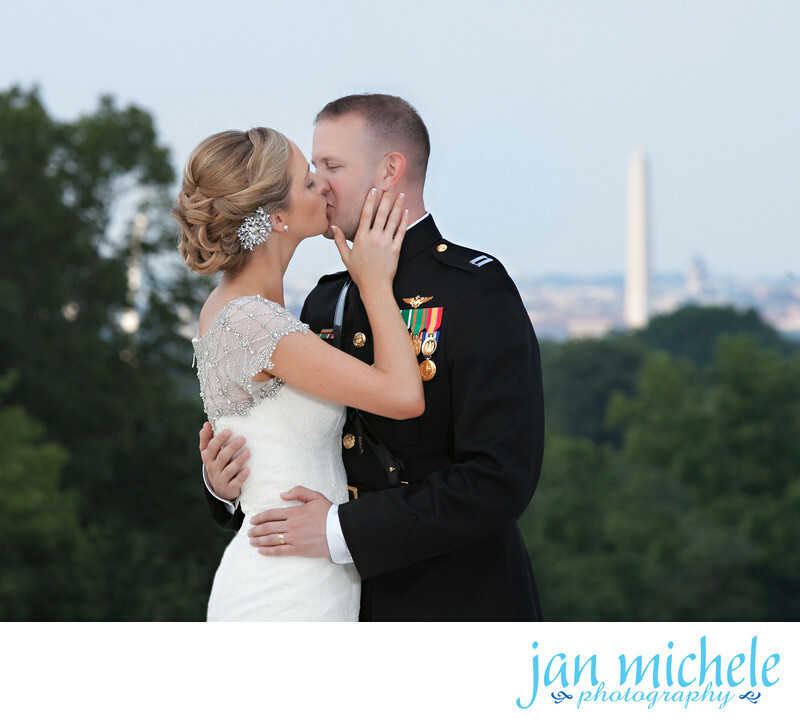 Kacie and Porter were married on the balcony at the Army Navy Country Club in Arlington, VA. The new clubhouse has a beautiful large balcony that overlooks the golf course and Washington, DC with a great view of the Washington Monument in the distance. This portrait taken right after the ceremony captures the day, the moment and the patriotic location of this military wedding. This couple has such a sweet story. They met at the wedding of her best friend and his brother. It was love at first sight for Porter. It was such an honor to capture their story and the beginning of their new family. As well as get to know both their families. My greatest goal is to capture the joy and love of the wedding day in story form and make an album and create portraits that will be enjoyed for generations. This family also takes every opportunity when they are together to get that large extended family group portrait. And so many of them purchased a copy. I'm so glad that their family history and each other are so important to them. A wedding is a big event for a family and documenting those times when the extended family gathers is so important. It may take a little extra time to gather a big group, but it's well worth the time. Location: Army Navy Country Club, Arlington, VA.